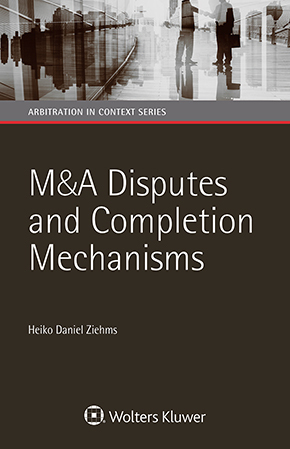 M&A Disputes and Completion Mechanisms provides an in-depth discussion of completion mechanisms in merger and acquisition (M&A) transactions, including key arguments for or against individual deductions or adjustments, identifies the factors that lead to post-M&A disputes and explains how to measure their financial consequences. In the course of an M&A transaction, the M&A professionals and their advisors face a series of decisions, often against the backdrop of an unrealistic deadline, imperfect information and a shrewd other side. In making these decisions, they have to deal with complex technical matters at the intersection of disciplines, including accounting, law, taxation, corporate finance, operations, environmental and strategy. It is not always possible during the negotiations to take a step back and contemplate issues that are likely to arise before or after completion that may result in a dispute or to address or mitigate risks. Further, a volatile 'real word' can – and often does – find its way into the transaction and cause dissonance – a cyberattack, turmoil in financial markets around closing as during the financial crisis, or the discovery of fraud, for example. It is therefore easy in these highly charged circumstances to create outcomes that end up in legal disputes. lessons learned on how to avoid or deal with disputes. The author analyses a large number of actual post-M&A disputes to bring into focus precisely where things go wrong in practice. He then sets out practical solutions to the problems dealmakers face, how to negotiate individual price adjustments and lessons learned from disputes. The analysis of prominent factors associated with legal disputes also provides diagnostic tools that can help avoid disputes. If a dispute has occurred, the book discusses how it can be resolved as well as the conceptual basis and practical approaches to the measurement of damages. This very useful book will be welcomed by M&A practitioners, be they in-house counsel, private equity, sovereign wealth funds, international arbitration centres or other players, as well as the investment bankers, accountants and the professionals who advise them. It will also prove to be of great value to those who deal with post-M&A disputes – judges, arbitrators and litigators – and legal academics interested in the M&A field, and to professionals who confront specific questions during a transaction or a post-M&A dispute.